GenEpic™ is a professional formula scientifically designed to restore essential nutrients lost due to stress, aging, and disease. This therapeutic formula contains 70 vitamins & minerals, 32 herbs, and 16 enzymes & phytonutrients and, when used as adjunct therapy for certain diseases, is proving to greatly reduce negative side-effects and patient suffering. Unlike common, over-the-counter multivitamins, the higher potency and proprietary ingredients in GenEpic™ offer greater nutritional benefits. Please take time to view the data under the Clinical Trial tab above. GenEpic™ has been formulated to enhance bones/muscles, brain/memory, heart/circulatory function, mood, eyesight, metabolism, immune system, hormone support and digestive systems. Adult Nutrition has never been so easy! Have you been taking vitamins by the handfuls to maintain your health? Is your cabinet overflowing with vitamins and supplements? Could you pay a car payment with the monthly expenses? Staying healthy does not need to be so cumbersome, expensive, or complicated to achieve! Each daily packet of GenEpic™ provides enchanced “ADULT NUTRITION” essentials at therapeutic levels. Only natural and pure sources have been used to create GenEpic™. These pure and natural ingredients are physician and pharmacist formulated. Strict inspection criteria is followed for the purity of each packet. 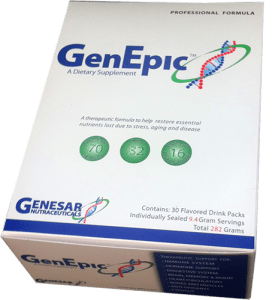 GenEpic™ synergistic formula complements each nutrient to increase bio-availability and absorption, thus providing increased energy, immunity, increased memory and nervous system boosters. GenEpic™ strengthens your heart and benefits your circulatory system with body building nutrients to support your healthy lifestyle.